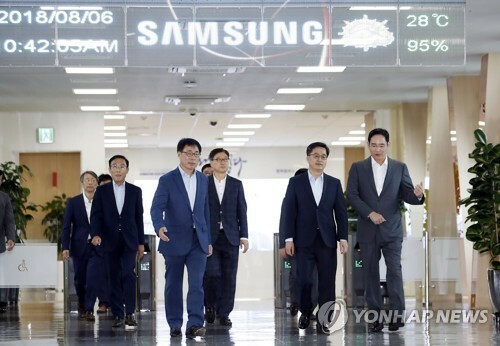 PYEONGTAEK, South Korea, Aug. 6 (Yonhap) — South Korea’s top economic policymaker on Monday urged Samsung Group, the country’s leading conglomerate, to do more to create jobs and spearhead innovative growth in the latest appeal to the business community to join the government’s job-first policy. In a meeting with Lee Jae-yong, the de facto chief of Samsung Group, and other top executives in Pyeongtaek, south of Seoul, Finance Minister Kim Dong-yeon stressed the importance of cooperation between the private sector and the government to usher in innovative growth for the company and job creation. “The government will create an ecosystem where corporate investment is made and provide support to the underprivileged,” he said. “Samsung as a leading player is also urged to take a crucial role in improving the ownership structure and stemming unfair business practices,” Kim said. The finance minister said the government promised to make efforts to resolve the request by Samsung for deregulation for bio business and to review a series of policies to meet Samsung’s other requests. “Whether to invest or not is totally up to a company,” Kim said, adding that innovative growth sought after by companies would help raise employment. The Moon Jae-in government is preaching growth centered on innovation, which it claims will help Asia’s fourth-largest economy secure potential growth and allow for a sustainable expansion that can benefit everyone. The Samsung executive said that the meeting served as an occasion to be mindful of the fact that the company needs to be supported by the South Korean people, investors and subcontractors as well as smaller firms. Lee also said that Samsung will create more jobs through technology development, though he stopped short of announcing detailed investment and hiring plans. According to those at the meeting, Lee said the tech company will make every effort to ensure that young people can have dreams and allow employees to have sense of pride in what they do. Samsung may soon announce a massive investment plan centering on employment and social contributions, in response to the request made by President Moon Jae-in during his visit to India in early July, where the two met for the first time at the opening ceremony of a Samsung Electronics’ production line. The Kim-Lee meeting came amid worries that Asia’s fourth-largest economy may be losing steam on weak private spending and investment. Adding to concerns is that the country’s job market is not showing signs of improvements in the wake of the implementation of hikes in the country’s legal minimum wage and shortened working hours. In particular, opponents to the minimum wage hike claim that the scheme is behind the recent slackened job conditions as small shop owners and firms are reducing staff out of increased worries over labor costs.